Upcoming is L.A. ZOO LIGHTS’ FAMILY NEW YEAR’S EVE on Thursday, December 31, 6 pm, providing an opportunity to celebrate the coming of 2016 in style with “skip-the-line” express entry, dinner buffet, soft drinks, complimentary champagne for adults, sparkling apple cider for kids, dessert, a ride on the Zoo’s hand-crafted carousel, crafts for youngsters, DJ dance party, cash bar and live broadcast of New York’s Times Square ball drop at 9 pm, after which guests are welcome to experience L.A. Zoo Lights until closing. FAMILY NEW YEAR’S EVE tickets are $65 for adults and $40 for children, or $60 (adults) and $35 (children) for GLAZA members. Tickets for this VIP-style experience are limited, so early purchase is strongly suggested. L.A. ZOO LIGHTS sets the Zoo’s enchanting environment aglow with breathtaking displays unlike anything seen in L.A. before, among them thousands upon thousands of LED lights, flurries of illuminated snowflakes, stunning 3-D animated projections, a musical light-and-water show and glittering light tunnels. The fanciful menagerie of animal characters brought to “life” include mischievous animated monkeys throughout the grounds, a gigantic glowing snake coiled on a roof, a hillside with “snowboarding” iguanas, 3-D animated elephants wearing colorful holiday sweaters, an origami-type rhino lit from within and so much more. L.A. ZOO LIGHTS is open every night from 6 to 10 pm Mondays through Thursdays, and 6 to 10:30 pm Fridays through Sundays and December 23. Captivating guests for an ideal family outing, meet-up with friends or date night, L.A. 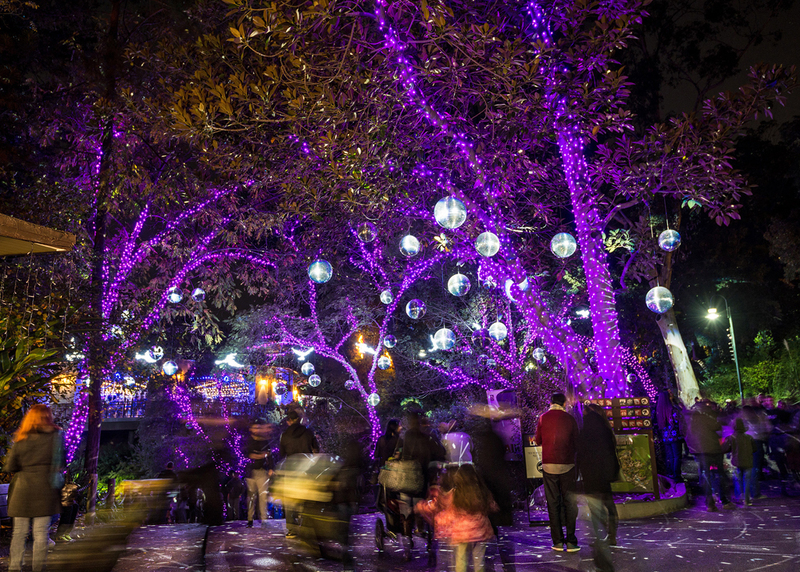 ZOO LIGHTS’ self-guided 60- to 90-minute walking tour through select areas of the Zoo – while most L.A. Zoo animal residents are asleep – offers a unique experience that features the only opportunity in Los Angeles to see real reindeer; visits with Santa Claus on select dates; and steaming hot chocolate, irresistible churros and other holiday treats and goodies for sale. 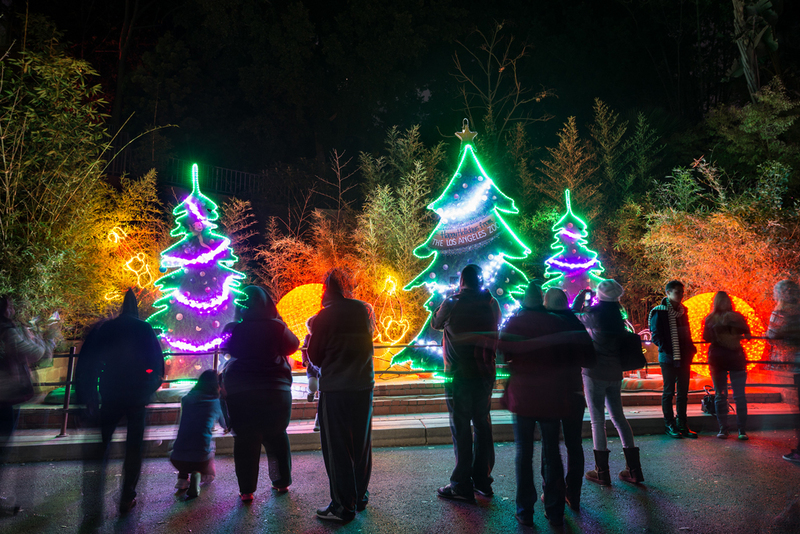 Last year, the first-ever LA ZOO LIGHTS was established by the private, non-profit Greater Los Angeles Zoo Association (GLAZA) as a festive new tradition. In addition to more lights, displays, décor, effects and a larger L.A. ZOO LIGHTS footprint in the Zoo, the event’s biggest expansion this year takes place in and around The LAIR (Living Amphibians, Invertebrates, and Reptiles), which boasts a giant, illuminated snake gazing down from the rooftop, flicking its tongue as guests enter the building. 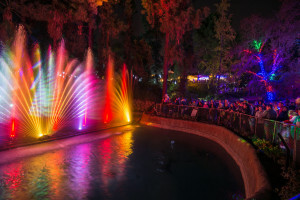 At an equally stunning next stop, guests encounter a Lightscapes: Wild Holiday aquatic show boasting lighted fountains and shooting screens of water with majestic projections of fanciful animations set to music. In several special areas are unique sound experiences, including music from Cirque du Soleil’s KURIOS – Cabinet Of Curiosities (performing December 10-February 7 at Dodger Stadium) as well as an eclectic mix of tunes hand-picked by local NPR station KCRW. The re-imagined Santa’s Village is in an all-new, glittering setting, the perfect location for magical holiday photos (available for an additional fee). L.A. ZOO LIGHTS has again been developed in collaboration with art director Gregg Lacy and Bionic League, entertainment-industry partners renowned for remarkable large-scale installations for festivals, stadiums, arenas, clubs, and artists like Daft Punk, Kanye West and many others. Sponsors of L.A. ZOO LIGHTS include KURIOS – Cabinet of Curiosities from Cirque du Soleil, Service Systems Associates, 99 Cents Only Stores, Edison International, Paramount Pictures, ScholarShare and Stella Artiois. Donors include The Georgina Frederick Children’s Foundation, Beth and Joshua Friedman, Larry and Sue Ivanjack, Donald and Susan Rice, The Shultz Family and the Employees of the Shultz Steel Company, The Simms Family Foundation, and The Marc & Eva Stern Foundation. This entry was posted in Home Page, Home Page Slider, News and tagged Christmas, L.A. Zoo Lights, Los Angeles Zoo and Botanical Gardens, New Year's Eve. Bookmark the permalink.